On September 24, we brought a new horse into our home. All summer we tried to go to the horse rescue near our house, but every time we planned on going over, the rescue was closed for bad weather or a holiday. So when the rescue was finally open on the day we planned on visiting in early September, and Dewey had just been returned by his previous adopters and was the perfect fit for Missy, we felt like it was meant to be, that there was a reason we weren’t able to visit the rescue sooner. Missy is a very gentle, quiet horse. I remember my Aunt Anne commenting that she was always being moved to different pastures with different horses because she was always getting picked on. 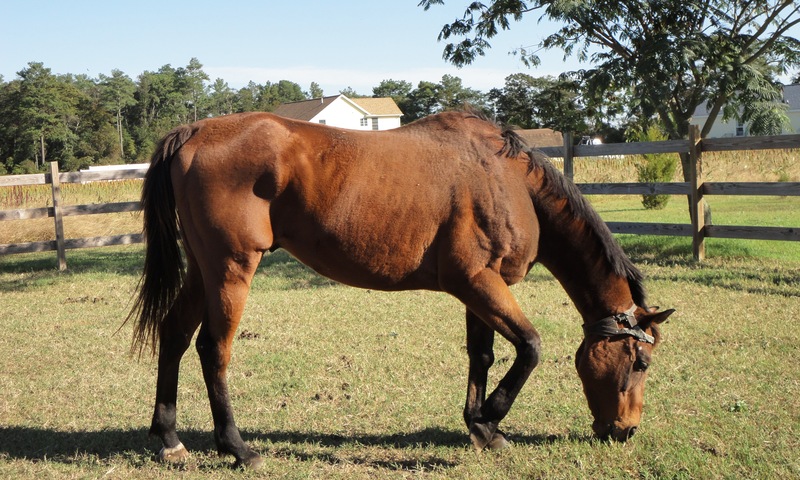 While Whimsical Equine Rescue has quite a few older horses, most were too dominant. Dewey was perfect. He was low in the pecking order, like Missy. And at 19, he was calm, gentle, and easy to handle. The only thing that concerned us was the calcium deposit on his front left leg, about the size of a baseball, from an old racing injury. His racing name is A.J. Jones, and he had 19 races by the time he was 4, with 6 wins. Seeing his legs, I hate Thoroughbred racing even more. His movement is awkward, and he can’t be ridden, though he walks around just fine and doesn’t seem to be in any pain, especially when food is involved and he trots to the barn. But how many others aren’t as lucky as him? How many have more severe, lifelong injuries or are sent to slaughter? 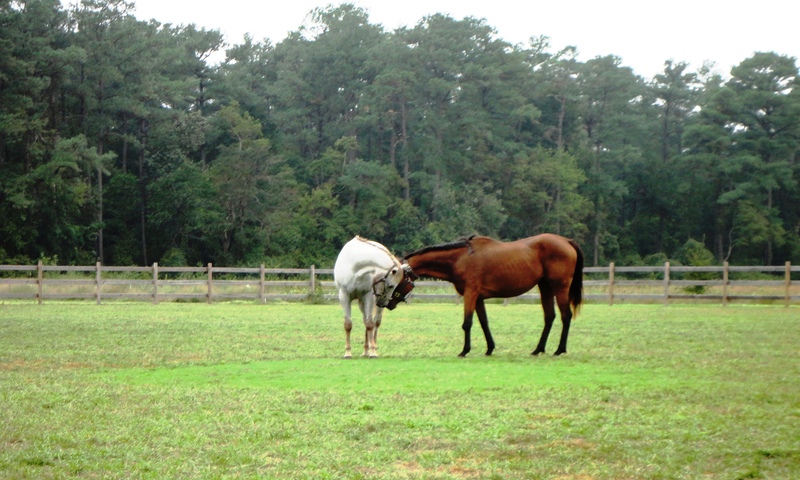 Dewey was one of the lucky ones, and is able to enjoy the life every horse should have. When Karen and Lisa brought him over, I held Missy while they walked him through the gate, and as soon as she saw Dewey, she stood taller and straighter than I’ve ever seen her. 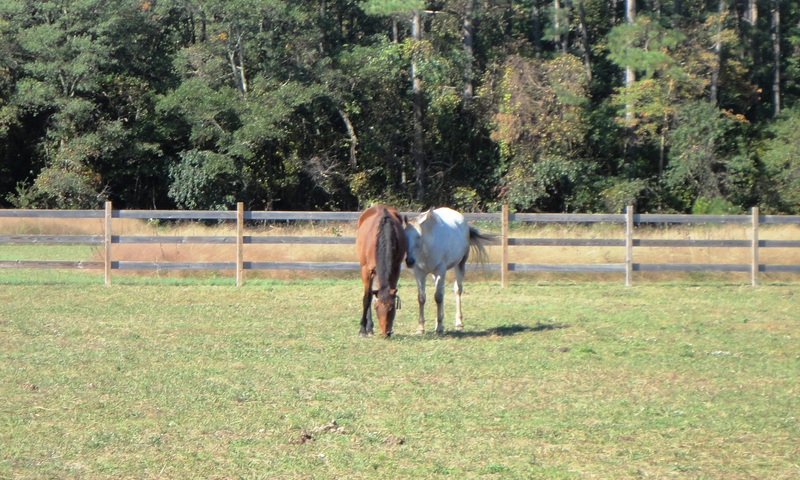 When we released them, they trotted over to each other, rubbed noses, and then Missy followed Dewey around the pasture as he checked things out. No kicking, no biting. Dewey and Missy say hello for the first time. 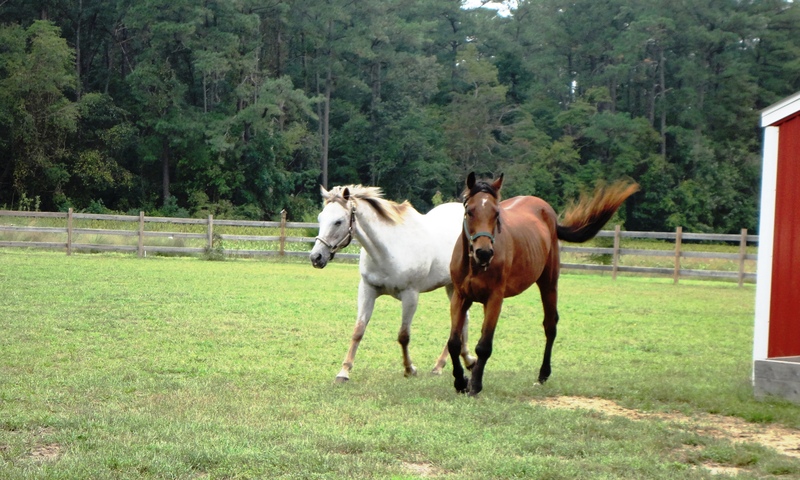 Missy following Dewey around the pasture. We’ve had Dewey two full months now, and he was underweight when we first got him. But he’s put on a lot of weight now, and is getting happier and healthier every day. I know Pie would be proud of us. He’s put on a little bit of weight. Your horses are absolutely stunning! 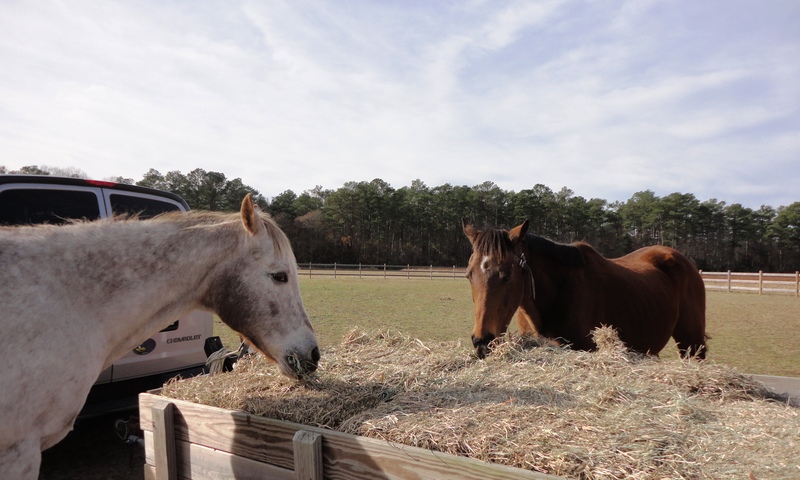 The brown one looks like my sister’s old horse, Emma Jet. They are such incredible and majestic animals, and that wonderful that you were to adopt Dewey. I’m sure you’re provide him a great home. Thank you! We try to make sure all our pets are as happy as can be :) And Emma Jet is such a beautiful name!